Jack (3), loves Dusty Crophopper! 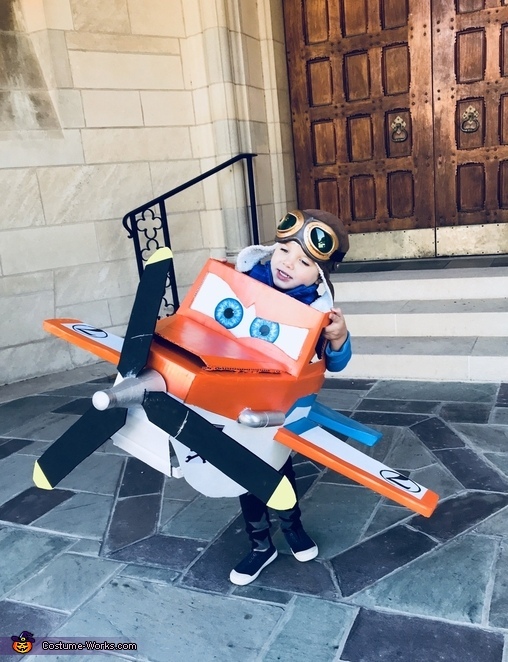 Thanks to Disney’s Planes movie for inspiring this memorable costume. We were also influenced after reading the children’s book- It’s Not a Box. We built this airplane after many trips to the local hardware store... we used: a giant Fedex box, a box cutter, PVC plastic pipes, acrylic paint. We added wide ribbon as suspenders to support the box. Adding heavy duty wire inside of the propeller is recommended to keep it from flopping. We bought a pilot cap and googles from the Air and Space Museum in Washington, D.C. A radio flyer wagon came in handy for trick or treating through our neighborhood. We loved watching our Jack-in-the- box smile as he pretended to be Dusty Crophopper! Amazing costume! Can't believe this was handmade.